Local people regularly meet up once a month or so to with Melinda Brown (Town Centre Manager) to do some planting, weeding and tidying up of our green spaces. This Sunday a few of us did some dead heading and weeding of planters and beds. More volunteers are always wanted, maybe you would like to come along next time? Because September has been exceptionally dry a lot of the little plants had shrivelled up. Its such a shame that all they needed was a little water to continue to flourish for a few more weeks. 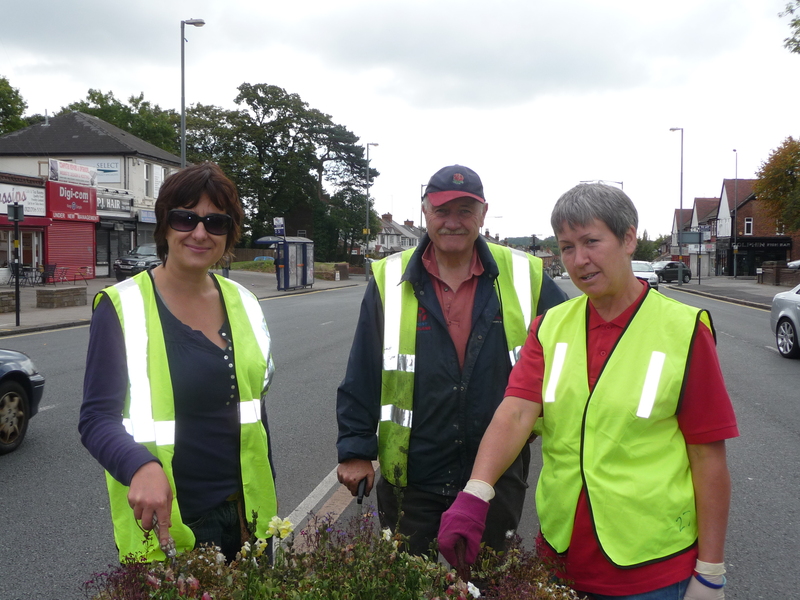 Do you live or work close to the planters and beds on Warwick Road? Even if you don’t fancy gardening, maybe you could occasionally water a planter during dry weather? Watering cans will be supplied if you haven’t got one. Perhaps you live above the shops and would like a little bit of greenery to nurture? Please get in touch to play your part in making Acocks Green a more pleasant place to live and work. An hour a month can make a difference! This entry was posted in Events and tagged Acocks Green, gardening, greening the green, melinda brown, planters, volunteers, Warwick Road, watering. Bookmark the permalink.